Goodreads Summary: A little boy offers advice on what NOT to give your mom on Mother’s Day, unless she’s an animal. For example, don’t give her a rotting log unless she’s a salamander or a bunch of flies unless she’s a spider! 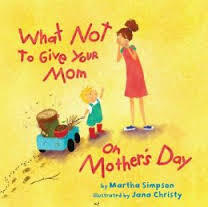 This is a great book to not only discuss Mother’s Day, but the animal world, too. The colorful illustrations will appeal to young children. Great read aloud for younger children. It would also be great for a classroom compare and contrast lesson on the difference between animal moms and human moms. 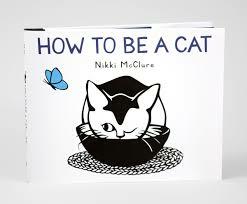 Goodreads Summary: In cut-paper artist Nikki McClure’s latest picture book, a kitten practices the basics of feline behavior over the course of a day. A single word of text per spread teaches readers �how to be a cat”—how to stretch, clean, pounce, feast—while the striking paper cuts illustrate the kitten’s attempts to imitate an adult cat’s mastery of each skill. At times the kitten triumphantly succeeds, and at other times the kitten struggles, in vignettes that range from whimsical to profound. A celebration of all things feline, How to Be a Cat also tells a universal story of mastering life skills, and of the sometimes tender, sometimes stern relationship between parent and child, teacher and pupil. Cat lovers of all ages will connect to this loving portrayal of a mentor-student relationship. This past fall I did a Mock Caldecott lesson with my third grade students. It went so well that I have decided to do this lesson each year. So I’m on the look out for Caldecott worthy picture books to use with next fall’s lesson. How To Be A Cat is one I will certainly use for this lesson. The cut paper illutrations are fabulous. They are simple but powerful. This book is an excellent addition to any picture book collection. It would also be a great gift for any cat lover. Goodreads Summary: You’ve heard of Horse Whisperers and Dog Whisperers, but Ellis thinks he might be a Worm Whisperer! Ellis Coffey loves animals. He spends so much time outdoors that sometimes he thinks he can talk with them. When he discovers a caterpillar that seems to follow his directions, he knows he has a chance to win the annual Woolly Worm race. The prize money is $1,000–exactly the amount of the deductible for his dad’s back surgery. If Ellis is right and he can train his woolly worm to be the fastest in the county, he’s sure can solve all his family’s problems. But when you’re trying to talk to insects, nothing is as simple as it seems. Hicks’ The Worm Whisperer is a great elementary read aloud. It’s a heart warming story of young ellis Coffey who struggles to find his way at school and to help his family who has been struggling since his mom lost his job and his dad began having back troubles. Young readers will identify with the challenges Ellis faces at school – from becoming the class clown to dealing with a less than friendly classmate to wondering if a certain classmate likes wooly worms like he does. Adults will appreciate Ellis’ strong character and he desire to help his family. The Worm Whisperer is a strong well developed story. 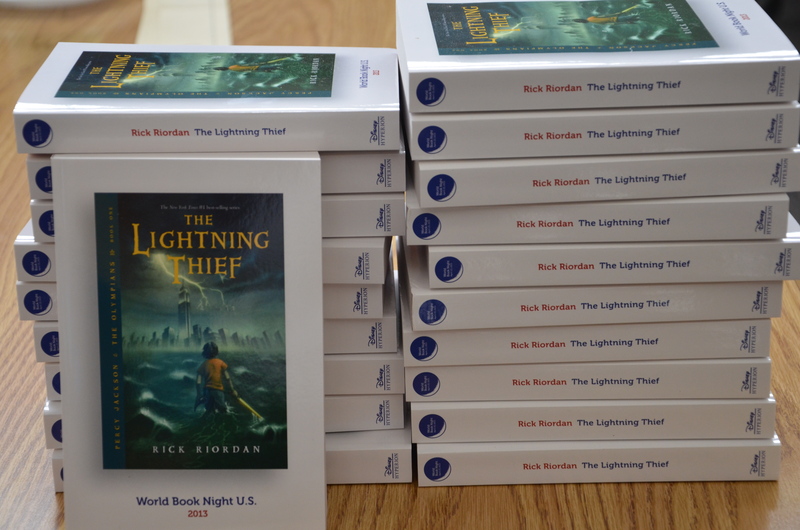 It is an easy read for students to read on their own or for a classroom read aloud. 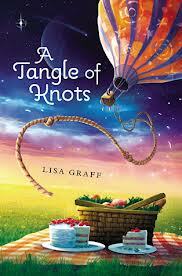 It would be a great companion book for a unit on animals (or worms) and would work well with character education units. Fans of Clementine and Judy Moody & Stink will enjoy this quick read. I will be adding it to the school library collection and will be putting it on my suggested 3rd, 4th and 5th Grades Summer Reading List. 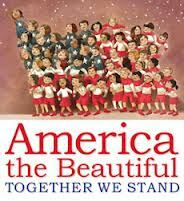 America The Beautiful Together We Stand is a beautiful picture book illustrating Katharine Lee Bate’s famous song. Each line of the song is illustrated by a different artist and also includes a presidential quote. My favorite quote is the one from Ronald Reagan “Our most precious resources, our greatest hope for the future, are the minds and hearts of our people, especially our children.” This quote is paired with the line “. . . for purple mountain majesties. . .” and is illustrated by Raul Colon. Included at the end of the book is information on our national landmarks and symbols, the words to “America The Beautiful”, and a bit of biographical information on Katharine Lee Bates. The illustrations are beautiful! I would love to have them all framed on my walls. I do a lesson with my third grade students on the Caldecott Award. I’m not sure this book would be considered for the award because it has multiple illustrators, but I do plan to use it not only with my Caldecott lessons but lessons on citizenship as well. It is a good resource for a quick lesson on national symbols, too. I will certainly be adding this to the school library collection. Summary from Goodreads: It’s 1944, W.W. II is raging. Jayna’s big brother Rob is her only family. When Rob is called to duty on a destroyer, Jayna is left in their small town in upstate New York with their cranky landlady. But right before he leaves, Rob tells Jayna a secret: they may have a grandmother in Brooklyn. Rob found a little blue recipe book with her name and an address for a bakery. When Jayna learns that Rob is missing in action, she’s devastated. Along with her turtle Theresa, the recipe book, and an encouraging, ghostly voice as her guide, Jayna sets out for Brooklyn in hopes of finding the family she so desperately needs. There are many things I like about this book. Patricia Reilly Giff is one of my favorite children’s authors. Her books are always a delight. 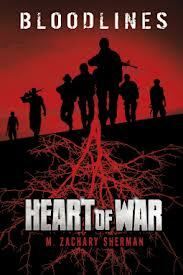 The story takes place during a WWII, my favorite historical fiction time period. It is a quick read and it includes recipes. Jayna is a strong and likable character. Giff does a good job of giving the reader a clear picture of Jayna even though it’s a short, quick read. However, I did feel as though the “ghost” character was a bit lacking. I wanted to know more about her. Overall, this is a good read for young readers. I plan to order it for the school library. Summary from the inside flap: When Una Fairchild stumbles upon a mysterious book buried deep in the basement of her school library, she thinks nothing of opening the cover and diving in. But instead of paging through a regular novel, Una suddenly finds herself Written In to the land of Story — a world filled with Heroes and villains and fairy tale characters. But not everything in Story is as magical as it seems. Una must figure out why she has been Written In — and fast– before anyone else discovers her secret. 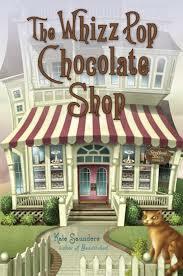 Together with her new friend Peter and a talking cat named Sam, Una digs deep into Story’s shadowy past. She quickly realizes that she is tied to the world in ways she never could have imagined — and it might be up to her to save it. First, let me say I liked the book. I really do enjoy stories where characters travel into books or stories. I love books that are in some way a “fractured fairy tale.” I liked all the characters – even the snotty Snow and her “villainous” mother Professor Thornhill. The plot is intriguing and makes the reader want to know more. Not all the good characters are good and not all the bad characters are bad. This keeps the reader on their toes. Second, to be honest, I did have a couple of problems with the book. Una never questions being written into Story. Any sane person would have questioned there sanity, would have experienced some disbelief – felt certain they were either dream or nuts. But Una never does. She just takes it as a rather every day occurrence. I also was a little disappointed in how “clueless” many of the characters seem to be. I’m used to children/young adults being exceedingly smart, but Una, Peter, and the others just seem to be a little too lost. Overall, this was an enjoyable read and I’m looking forward to Story’s End which will be released in April. 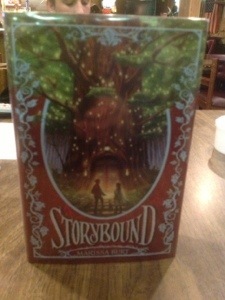 Storybound is one of our new books. See Mrs. Archer if you’d like to check it out.